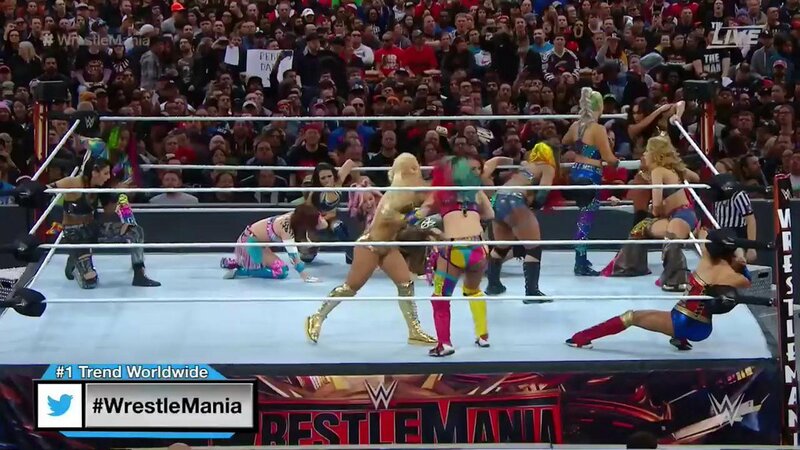 WrestleMania 35: 2nd Annual WrestleMania Women's Battle Royal (Kickoff) - Wrestling Inc.
We go to Renee Young, Vic Joseph and Percy Watson at ringside. Lilian Garcia is the special ring announcer. The women's division starts filling the ring up. Naomi gets her own entrance, followed by Asuka. The bell rings and Nikki Cross goes insane, which has everyone attack her. Kairi Sane is in the match. Maria Kanellis gets eliminated first. Candice LeRae works on Cross. Asuka eliminates Cross and Candice with Hip Attacks on the apron. Ember Moon is in the match making her return. She goes at it with Naomi now. Moon with The Eclipse on Lana. Moon tries to dump Naomi but she fights back in. Dana Brooke tries to assist. Ember eliminates Naomi. Mandy Rose works on Moon now. Lana ends up eliminating Moon. Lana goes wild but fans boo her. Sane works on Lana now. Lana kicks her back. Liv Morgan and Sane trade shots. Sane goes to the top but Sarah Logan knocks her off to the apron. Logan stalks Lana. Ruby Riott, Liv and Logan team up on Lana now. Lana gets eliminated. Sane goes to the top and hits her big elbow on Logan. Liv comes from behind and tries to dump Sane. Sane sends her to the apron. Ruby assists and Sane gets eliminated by The Riott Squad. Carmella and Logan go at it now. Zelina Vega takes Logan down with a kick. Vega and Ruby trade shots. The Riott Squad teams up on Vega, then Asuka. Ruby tosses Asuka but she hangs on. Dana also brawls with The Riott Squad and gets some offense in on all three members. Dana eliminates Ruby. Dana also tosses out Liv for a pop. Vega ends up going at it with Brooke and hitting the double knees in the corner. Rose and Sonya Deville eliminate Vega, then Brooke. Fans boo them as they celebrate. Rose and Deville double team Mickie James in the corner now. Mickie eliminates Rose. Sonya eliminates Mickie. It's down to Sonya, Asuka and Logan now. They all go at it now. Asuka takes both opponents down at once. Asuka fights off Logan with kicks. Deville gets eliminated, by Asuka it looks like. Logan tosses out Asuka and it looks like she won but Carmella comes back in the ring and was never eliminated. Carmella comes from behind but Logan drops her. Carmella and Logan take turns trying to dump each other now. Carmella finally eliminates Logan with a superkick from the apron.